Senator Hillary Rodham Clinton has returned from her visit to Iraq with a bold (if not entirely new) recommendation: Congress should vote to cap the number of U.S. forces the president can deploy to Iraq. (She notes that her demand has precedent in the experience of Lebanon in the early 1980s: Was she pleased with the results of that congressional intervention?) She thereby joins Senators Christopher Dodd and Barack Obama, among others, in the demand that Congress assume responsibility for operational military decisions — and, in fact, for the conduct of the war. Clinton proposes, for no very clear reason, to cap the number of American forces in Iraq at their level as of January 1, 2007. America, of course, was not winning in Iraq on the first of this year, so such a resolution is, in fact, a resolution to accept defeat. Oh, no, Democrats will say. They're simply for a political solution, not a military solution. But Democratic claims that Iraqis must immediately find a political solution to their political problems are laughable in the face of the violence in Baghdad. Abandoning American efforts to control the violence in Iraq would lead to an increase in violence. This would in turn reduce the odds of peaceful and constructive political discourse, and would further undermine any spirit of compromise between the competing Iraqi factions. Perhaps the deaths of hundreds of thousands of people and the forced migration of millions would eventually lead to a certain exhaustion. Is that the outcome Senators Clinton, Dodd, and Obama have in mind? It's a far cry from the Democratic Party that insisted on sending American forces to stop ethnic cleansing in war-torn Bosnia in the 1990s, to the one that now declares an Iraqi bloodbath no concern of ours. Beyond that, Clinton's statement completely ignores the significance of a congressionally mandated cap on troop strength. American forces are fighting in Iraq every day. They do not have enough strength to control the violence they are facing. The efforts of Clinton and others would prevent the new commander in Iraq, David Petraeus, from working effectively to bring the violence under control. There is every reason, therefore, to imagine that violence would continue to increase. This would be the effect of Sen. Clinton's legislation. An increase in violence, furthermore, would place American forces in Iraq at greater danger as they move around the country (which they would have to do even if their role were restricted to training Iraqi troops, as some have demanded). It is easy to imagine circumstances in which it would be necessary to send more troops to protect Americans at risk in Iraq — which this resolution would forbid. Even if Senator Clinton demanded an immediate withdrawal of U.S. forces (and she claims she does not want that), there are many circumstances in which additional forces would be required to make it safe for American troops to leave. Why would Senator Clinton, or any other responsible person, wish to deny the commander in Iraq the ability to request forces necessary to ensure the safety of American soldiers? Why, above all, would she or anyone else imagine that it is appropriate for a committee of 535 people to micromanage a war by setting a precise (and arbitrary) figure for the number of soldiers the commander on the spot can deploy? There is one man who should be recommending the size of American forces in Iraq, and that is the incoming commander, General Petraeus. Neither the Bush administration nor any collection of congressmen should preempt his professional evaluation of the situation and of the forces necessary to accomplish his mission. It is foolish and absurd for politicians to propose resolutions on American troop strength in Iraq before even hearing General Petraeus's voice in the debate. And when he has spoken, Senator Clinton and her colleagues should carefully weigh the burden they will take on themselves if they dismiss his advice. Republicans should not hesitate to point out how irresponsible their Democratic colleagues (and some Republicans) are being. Senator Clinton's troop cap is dangerously foolish. The nonbinding resolution of disapproval Senator Biden has proposed is irresponsible. The fact is that President Bush has, as he was widely and correctly urged to do, changed strategy. He's put a new commander, General Petraeus, in charge. 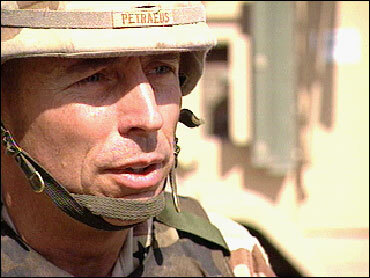 Petraeus thinks the new plan can work, with the support of additional troops. He'll be confirmed by the Senate and sent out to the theater this week. Members of Congress should ask themselves, "What can we do to help Petraeus succeed?" Or would Senator Clinton and the Democrats just as soon lose?